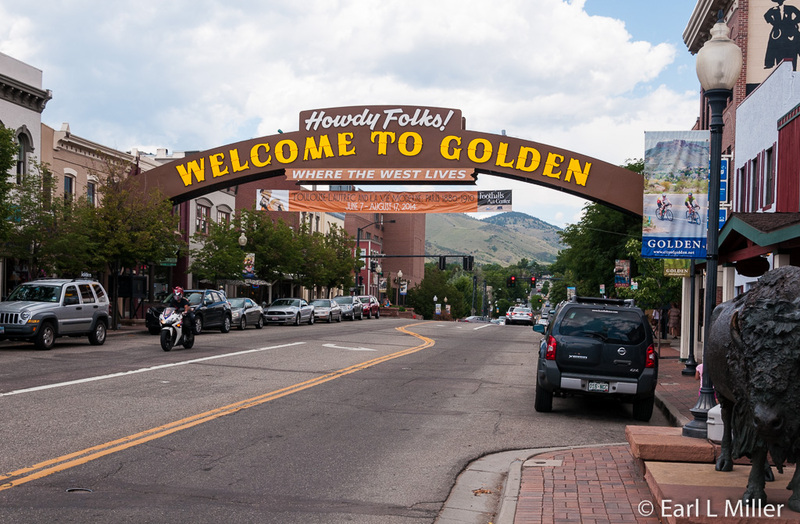 Many Colorado visitors are aware that Golden is the home of Coors Brewery and the Buffalo Bill Cody Museum. However, fewer people know about the town’s rich history or that it provides a wealth of attractions. This three-part article explores what Golden has to offer. Golden owes it origins to being a supply town for gold miners seeking their fortunes in the nearby mountains. Farmers treasured it for its rich soil while coal mining and clay extraction also encouraged settlement. Politics made a statement here, too, with Golden City becoming the capitol of the Colorado Territory in 1862 until 1867. At Golden’s downtown Old Capitol Grill Restaurant, dine in the building where the territorial legislature met. By the end of the 1860's, Golden City was also the seat of Jefferson County. Local citizens fought to keep the capitol in Golden. Outrage reigned when Denver won and became the capitol by one vote. In the 1870's, the town housed five smelters, four flour mills, and the Colorado Central Railway, the first railroad accessing the mountains to the west. In 1867, Golden Paper Mill opened, and was the only papers mill west of the Mississippi River. Coal mining remained important through the 1930's. Clay quarries led to the production of pottery, porcelain, bricks, and tile. The city’s brick making industry, lasting almost a century, included exports to China. In 1873, Adolph Coors opened his famous brewery. In 1949, Bill and Dorothy Harmsen started Jolly Rancher candies, now owned by Hershey Foods. The city became a strong center for intellectual development. In 1874, the Colorado School of Mines, specializing in engineering and applied science, opened. Golden also became home for the National Earthquake Information Center and the National Renewable Energy Laboratory (NREL). Growth continued until the 1980's when Golden’s historic downtown experienced a decline. In response, the city established the Golden Urban Renewal Authority (GURA) whose mission was to stimulate business, improve the town’s appearance, and make their downtown a popular gathering place. Today Golden boasts a population of more than 18,000 people. Even a short visit to downtown, indicates GURA has worked. Visitors to Golden should make the town’s visitors center their first stop. It has the customary brochures and maps as well as volunteers willing to answer questions. But it’s also the place to pick up Golden Tickets. These are tickets offering discounts of from 10 to 20 percent at participating restaurants, shops, and attractions. Some allow for an opportunity to win cash prizes up to $500. You present the ticket to a participating venue when you make your purchase. They scratch the amount off your card to see your savings or if you won a cash prize. Odds in winning cash are one in 200 and for winning $500, one in 10,000. The tickets are also handed out, one per person, after the Coors tour. Hours at the center are Monday-Friday, 8:30 a.m. to 5:00 p.m.; Saturdays, 10:00 a.m. to 4:00 p.m. Their telephone number is (303) 279-3113 and the address is 1010 Washington Avenue. Consider driving over to take a photo of the Colorado National Guard Armory. It’s listed in Ripley’s Believe it or Not as the largest cobblestone building in the United States. It was constructed in 1913 by the Colorado National Guard as an armory, quarters, mess hall, and auditorium for the Guard’s Company A of Engineers. When the building was completed in 1914, the Company lived on the second and third floors while the first-story was available to rent. Among the armory’s original uses were Golden’s Post Office (northeast first-level storefront), photo shop (northwest first-level storefront) and map room (tower). In the years that followed, it served in whole or in part as a hotel, offices, industrial bank, and student housing. During the 1918 flu epidemic, it became an emergency hospital used by the Red Cross, and in 1933 it became the Civil Works Administration’s local headquarters. 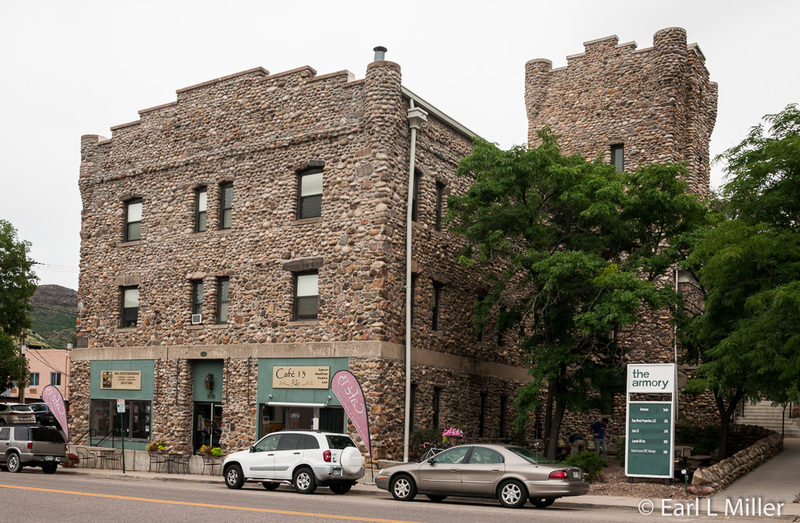 Today it serves as Colorado School of Mines student housing with offices and shops. The Armory was the first of many area buildings of its time constructed of cobblestone, fieldstone, or other native stone. This was a local architectural movement that continued into the 1940's. While most towns these days have a small history museum, not all of them are interactive or modern in tone. I found the Golden Historical Center to be both. Though the museum isn’t large, the exhibits are so interesting you can easily spend two hours there. Three displays are permanent. “Made in Golden: Where Innovation Lives” highlights the town’s industries. Watch a video on Coor’s introduction of the world’s first seamless two-piece aluminum can in 1959. Learn about the manufacture of Spyderco knives, Mountainsmith backpacks, Kong Classic pet toys, and Coorstek, who produced Coor’s porcelain products, ranging from fine china to scientific ware, since 1910. Then read why 150 businesses call Golden home. You can also make yourself a Golden coin souvenir from the Epilog laser-engraving station or visit their innovation lab where you can create your own toys. “Turn it Up: Golden’s Musical Memories” features a number of vintage instruments including two rare, square grand pianos. 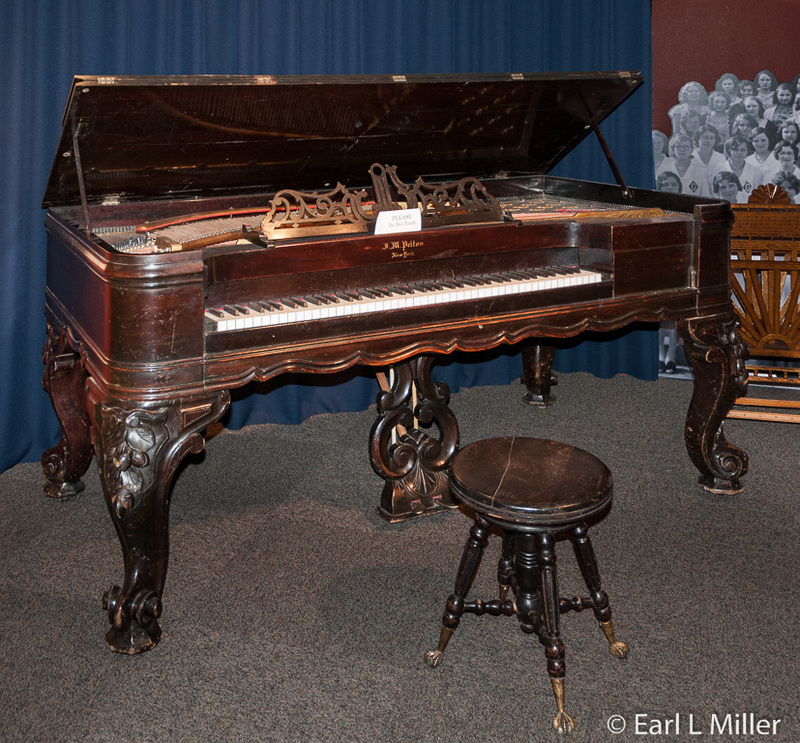 One of these is a J. M. Pelton square grand piano purchased by Colorado Territorial Governor John Evans for his daughter Anne. It’s the same Evans for whom Mount Evans was named. You’ll also see a velvet-covered Regal upright piano. Take time to sit in a comfortable chair in their Music-Maker lounge and listen to six short videos on everything from how a square piano was restored to a jam session at the Golden City Brewery. The third permanent exhibit is “Show & Tell: Highlights from the Collection.” On display are such artifacts as a Wells Fargo stagecoach box dated 1866, Golden’s first library desk, and a diorama depicting Golden in 1879. 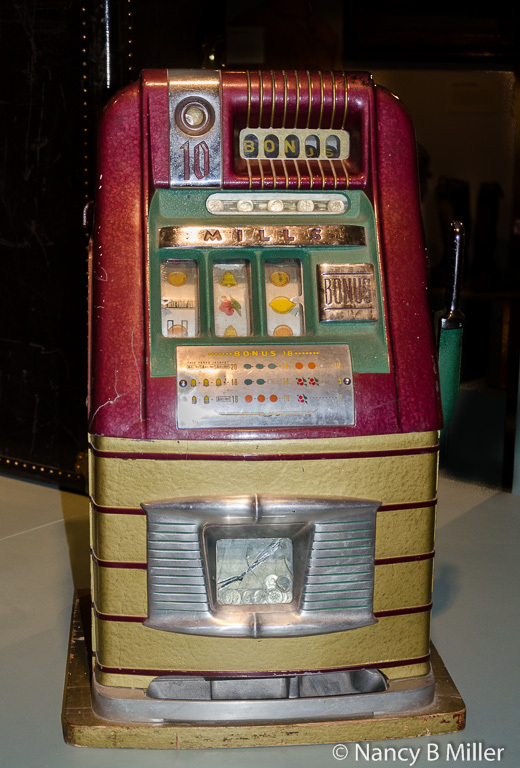 You’ll also spot the only slot machine to survive illegal gambling common in Jefferson County during the 1940's and 1950's. Finish your visit to this section by watching the film “Capturing the Golden Past: 1900-1950" consisting of first-person accounts of residents sharing their memories about their lives in Golden. The temporary exhibit that we saw featuring fifteen important Golden citizens is no longer on display. “Calendar Girls to Cowboys: The Art of Selling Coors” has replaced it and will be shown through October 11, 2015. It is a collection of more than four dozen rare and classic Coors signs on loan from nine corporate and private collections. 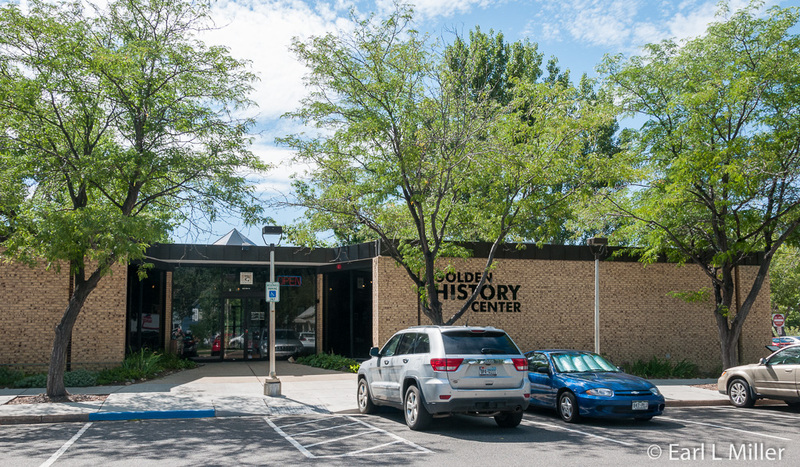 The hours for Golden History Center are Tuesday through Saturday from 11:00 a.m. to 4:30 p.m. and Sunday noon to 4:30 p.m. Admission is $3 for those over age six. 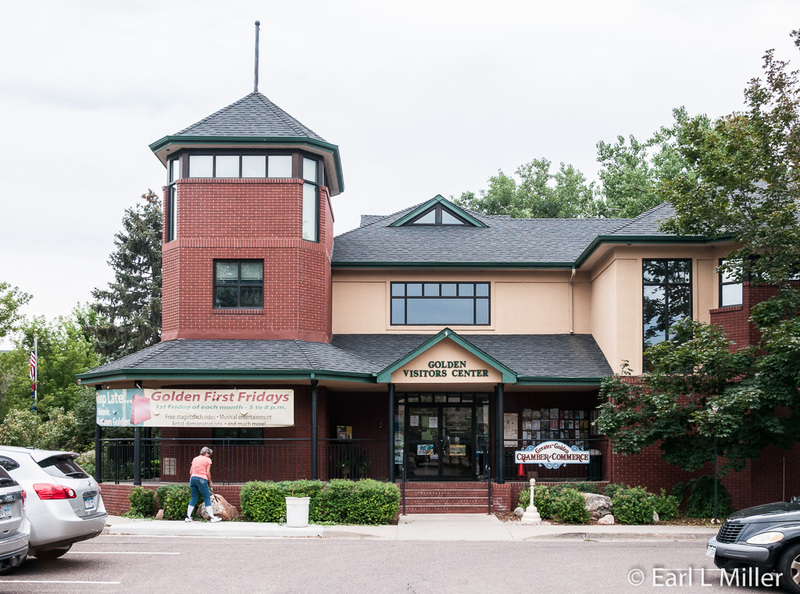 You’ll find the Center at 923 10th Street and the telephone number is (303) 278-3557. 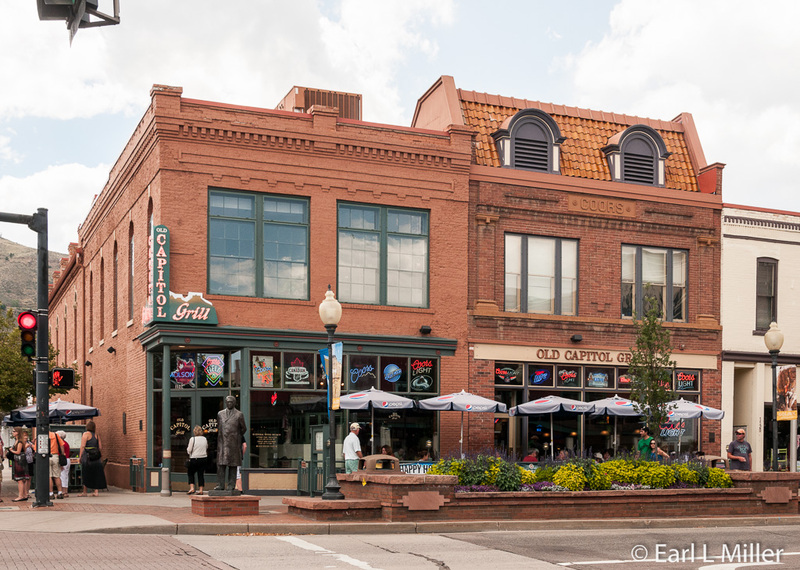 After such a busy morning, you might want to continue your history tour at Old Capitol Grill housed in the Loveland Block. William A. H. Loveland constructed the building in partnership with Golden City Lodge #1, Ancient Free and Accepted Masons, the first Masonic lodge in Colorado. When Golden became the territorial capitol, the legislature met in separate buildings across Washington Avenue. In 1866, they moved to this building and conducted their business here through 1867. The House of Representatives met in the second floor Masonic Hall which became known as Representatives Hall. The Council (how the Senate was identified during Territorial Days) met at the west end of the upper floor. Four committee rooms spanned the space in between. After losing the capitol, the Loveland Block had other uses. It was the headquarters for the Colorado Central Railroad, the first railroad penetrating the Colorado Mountains. In 1878, after an arsonist attacked the Colorado School of Mines campus, the upper floor temporarily became home for the school’s sessions. Loveland was involved with the railroad and one of the first trustees for the school. But throughout its history, its major purpose was serving as a mercantile dry goods store and grocery from its construction in 1863 until 1978. For 57 of those years, until 1971, Nicholas Koenig, president of Golden’s Board of Trade and mayor ran this establishment. From 1941-1971, it was one of the largest grocery stores in Jefferson County. Since 1978, the building has served as a restaurant. It became the home of Old Capitol Grill in 1997. Food at this restaurant is mediocre. However, people go because of its history, which is reflected in the menu. Specializing in pub food, you’ll find such items as Miners Pot Roast, Senate Caesar, Settlers Salad, and Capital Punishment Chili. Most lunch item prices are less than $10. Hours are Sunday - Thursday 11:00 a.m. to 8:30p.m., Friday and Saturday 11:00 a.m. to 9:30 p.m. You’ll find Old Capitol Grill at 1122 Washington Avenue. Their telephone number is (303) 279-6390. After lunch, walk around the corner to the Astor House. Tours are self guided and cost $3 or you can buy a combination ticket with the Golden History Center for $5. Take time to listen to the tapes found in the podiums in three of the four upstairs bedrooms. They relate Astor House history. Step out on the balcony for a great view of the town. Seth Lake constructed the building and ran it from 1867 to 1887. In his time, he had his “culinary” department out back under a lean-to, a huge barn to stable horses, and an outhouse. He charged from $1.25 to $2 a day. Different owners purchased the property until Ida Goethe, a German widow, bought it in 1892 and started renting its twelve rooms. 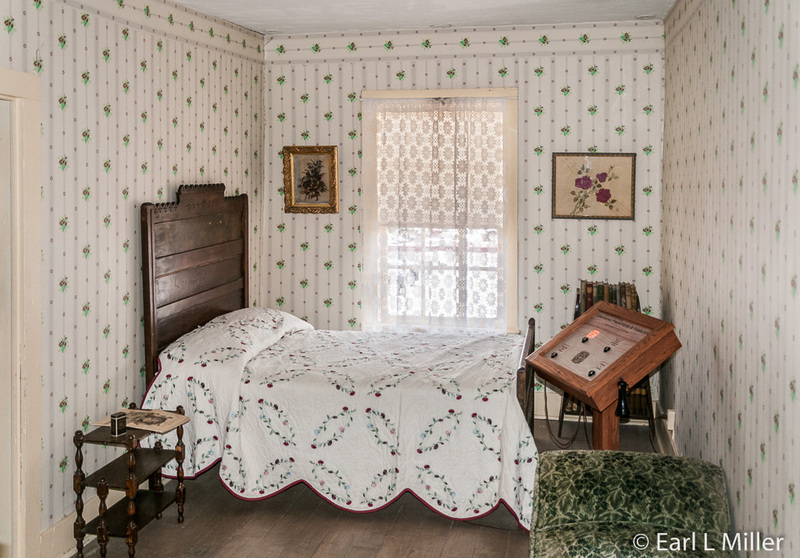 She changed the name to Hotel Boston and made improvements such as installing an 1890s kitchen and building a brick wash house that’s still out back. She installed the first bathtub in town for which she charged 25 cents to take a hot bath. It’s reported one Golden resident said she made more money off the bathtub than from the rest of the hotel. In 1904, Goethe was one of the first in Golden to have hot and cold water and electricity piped into a boarding house. She opened a cafeteria for students at Colorado School of Mines that enticed them to become boarders at her establishment. Soon the students were a majority of her boarders. This trend continued until the 1960s. In 1972, the Astor House was sold and slated for demolition to be replaced by a parking lot. The Golden community rallied to save the building, and it began life as a museum in 1973. Self guided tours are available Tuesday through Saturday 11:00 a.m. to 4:30 p.m. and Sunday noon to 4:30 p.m. During the summer, it’s Tuesday through Saturday from 10:00 a.m. to 4:30 p.m. The building is located at 822 12th Street. 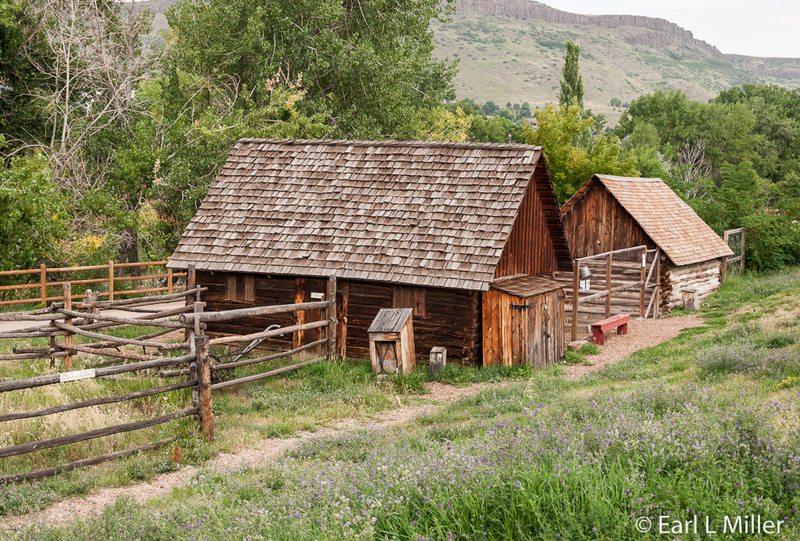 This park, located at 11th and Arapaho, was created from the relocation of many original buildings from Pearce Ranch (which operated 1867-1915) in Golden Gate Canyon, about fifteen miles from their present location. They found their current home when Golden citizens responded to a housing development threatening the buildings in the 1990's. Beginning in 1994, they were moved log by log to Golden with the park opening the spring of 1999. It’s now open sunrise to sunset with no admission charge. Your tour is self guided. 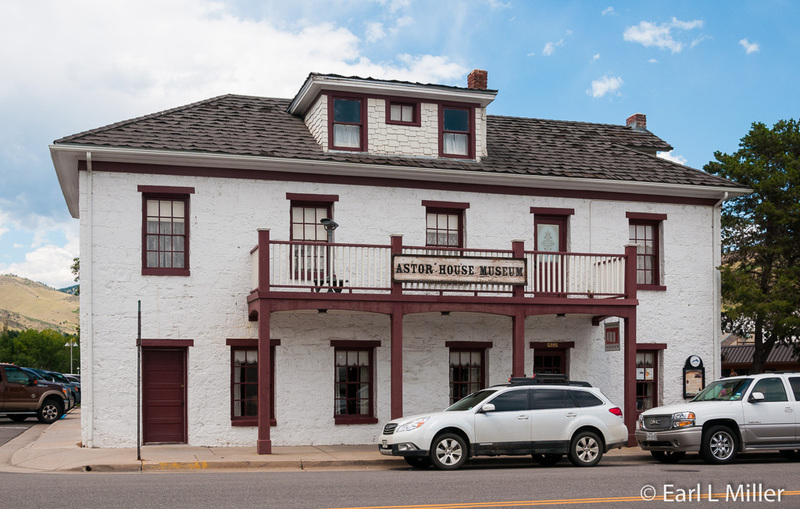 The first building you will see is an 1876 one-room schoolhouse originally located in the Canyon where it served first through eighth graders until 1951. 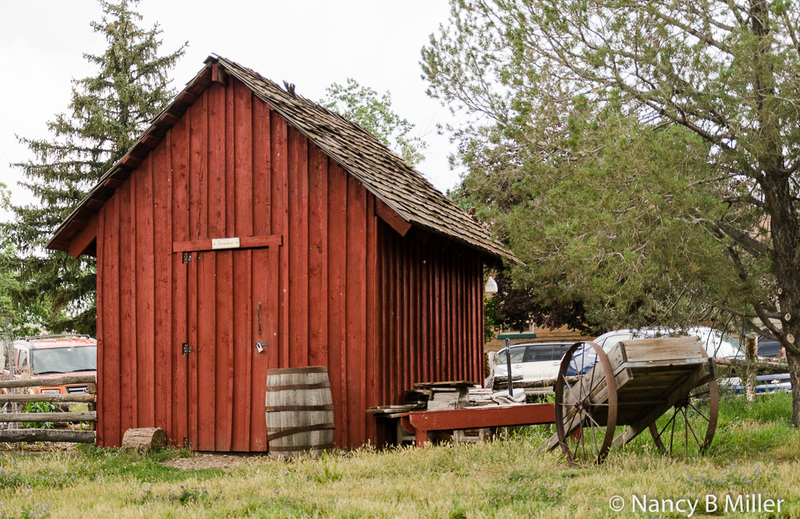 You’ll see a smokehouse, root cellar, outhouse, heirloom garden, and 1878 Pearce/Helps Cabin before you reach the oldest structure, the 1873 Reynolds cabin. Structures on the other side include a hay barn, blacksmith shop, corral and barn, chicken coop including chickens, and a bee yard housing 30,000 bees. The blacksmith shop and root cellar were built on site. When we visited, we were disappointed that the web site lacked this history nor were the buildings marked as to purpose, former location, or date. You can now find a detailed history of the ranch and the buildings you’ll see on the Clear Creek History Park section of the www.goldenhistory.org web site. It also contains a short video on the village. Also, new to the site is a Clear Creek History Park walking guide which explains what you are seeing. Take time to print the guide before you go as it will make your visit more worthwhile. Many regarded Lowell, Massachusetts highly for its vigorous industrial growth. Golden soon earned the nickname “Lowell of the West.